Windows 7 screensaver with free moving 3D Brachiosaurus. Try animated dinosaur screensaver and get an unbelievable experience of virtual dinosaur world for free. The screensaver with 3D animated Brachiosaurus is compatible with Microsoft Windows 7, Windows Vista and Windows XP. Brachiosaurus was one of the tallest and largest dinosaurs yet found. Like all sauropod dinosaurs, Brachiosaurus had a long neck, small head, and relatively short thick tail. The dinosaur walked on four legs and unlike most Dinosaurs, its front legs were longer than its hind legs. These unusual front legs together with its very long neck gave it a giraffe-like stance and great height, up to 12-16 m tall. The dinosaur was about 26 m long, and weighed about 50-80 tons. 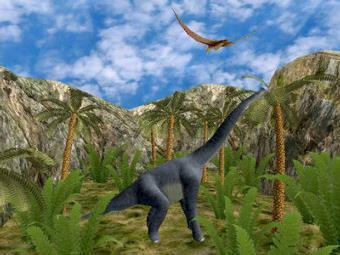 Age of Dinosaurs 3D includes the animated Brachiosaurus and other popular dinosaurs. Click on the link below to learn more about the Age of Dinosaurs 3D Screensaver, If you want to turn your computer monitor into a virtual dinosaur world. Click on one of the links below to learn more about animated dinosaurs from Age of Dinosaurs 3D Screensaver. 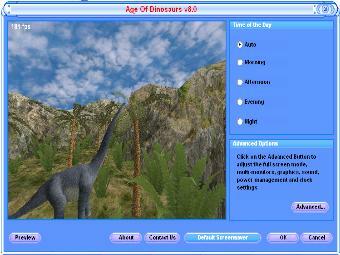 With Age of Dinosaurs 3D, you can set the great mood, delivering a virtual world of most popular dinosaurs directly to your computer screen!